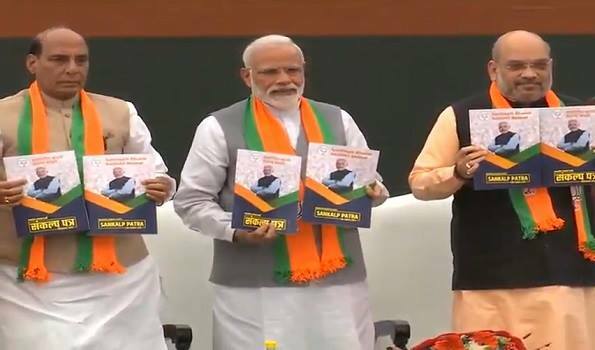 New Delhi:Prime Minister Narendra Modi on Monday unveiled the BJP manifesto for 2019 general elections with the theme 'Nation first' and pledge to take the country to new heights ensuring national security and achieving a new milestone globally. Union Minister Rajnath Singh, who is chairman of the manifesto committee, said it is a document to make a new India. ''We are now ambitious to emerge a key global power and among top three economic powers, ''Mr Singh said. The BJP is committed to Uniform civil code, he said. ''It is a visionary but practical sankalp yatra,'' Mr Singh describing the manifesto. Mr Shah said in past five years NDA regime was successful in unleashing an unprecedented era of development and guided India's journey to emerge as global player. ''Our most important achievement was to ensure security. The surgical strike gave a clear message,'' he said, adding that ''Our government gave a clean and transparent government''. The Modi government took 50 vital and big decisions, he stressed. ''Desh ki aasha.. apeksha ban chuki hai (hope of the country has become aspiration),'' Mr Shah averred, adding that 2019 polls will be 'election of apeksha(aspirations)'. He maintained that people want solution to Kashmir problem.The 45-page manifesto has been made after enlisting the views of 6 crore people, Mr Shah said. In the General Election 2019, the BJP is seeking mandate while in power. The saffron party returned to power in 1999 after Kargil but failed to do so in 2004 when the party's 'India Shining' campaign apparently did not convince people.